We had an issue with the copyright on our old Aa-Zz Puzzles clipart I had purchased, so I created a new set! Hopefully, you will all enjoy this set just as much! 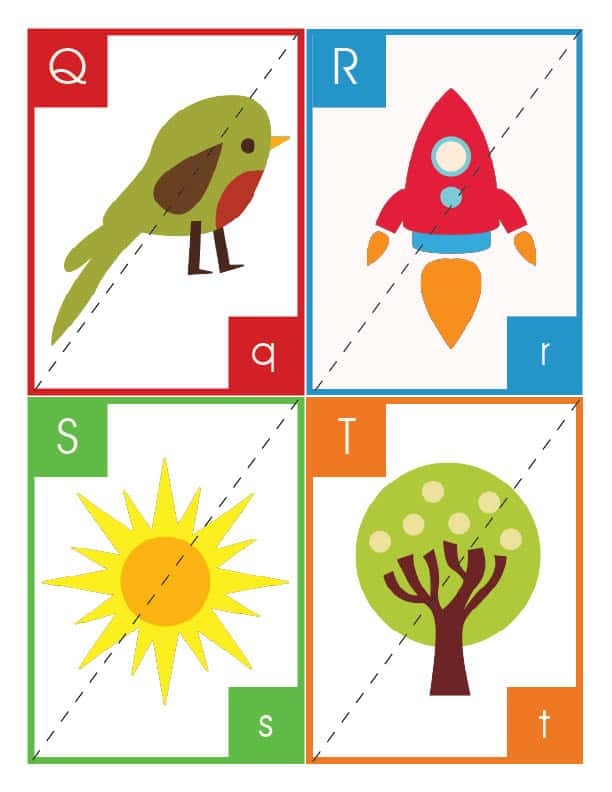 I am offering two options with this set – the first is to just use them as Flash Cards and the second you can cut down the dotted middle line and make them puzzles! I suggest with both options to print on the pages on cardstock and to laminate (I use this laminator and these pouches) prior to cutting them up! Hi Pam, these cards are PRECIOUS! I love them and know my daughter will, too. It’s not letting me print or save these to my computer. Do you have any ideas on what I’m doing wrong? Thank you for all the amazing resources you offer on your site…I really appreciate it!!!!! I downloaded the cards, but do not have the print option. Would you be able to help me with this?Thank you! I downloaded these and I don’t have the option to print them. Am I doing something wrong? I’ve downloaded them twice and the print button is greyed out. Help? 🙂 Thanks! That’s weird Susan – could it be something with your Reader? I’ve never heard of this. What’s your email and I’ll send them your way and see if maybe it works that way! I too am having issues trying to print, with the same request of a password to print. I tried getting around this by saving the file to them print, however it is only printing 3 sheets and in this it is coming up capital A in the top corner with a picture of a bird and a capital E in the bottom corner. Usually when it requests a password it is because the version of Adobe Reader is older and not compatible with the files I create and export. Go ahead and email me at pam at overthebigmoon dot com and I’ll shoot you over the file and we’ll try it that way. I’m not going to be able to get to this problem for a few days, as we just had a site redesign switch and we’re still working on getting everything finished with it. Thanks! I’m also having trouble printing the puzzle file. Does anyone know what to do to get it to print? These are wonderful! Thank you so much for the download! I’m having trouble printing the Puzzle file. It says it is secured, and won’t let me print…help? Susan- Thank you for bringing this to my attention. I’ll be honest – I created these late at night and I hadn’t even thought that through. I will be updating this set in the next few days and posting a new revised set. Thanks again – I really appreciate it! I was just coming to post the same thing. I just printed them off and realized that the “g” and “k” were not phonetically correct. When will you ever use the silent G? I appreciate the the puzzles and all the work that is put into the packs, but I think in stead of gnome I will say garden gnome and tweak the knight to look more like a king. I just updated the cards… thanks so much for the input! cannot print abc non- puzzle cards which are actually listed under puzzles???? please advise and thanks these are really lovely can’t wait to print them soon….. These are so great! The only issue I have (as an experienced educator) is that it is confusing to teach a LONG I–Ice cream– when we are teaching children the short vowel sounds. There are so many great short “i” words…igloo, iguana, etc…Too bad they decided to go with the long “i” sound. Also, “owl”–“OW” is a special sound, not the sound that short “o” makes. Just a pet peeve of mine that I come across frequently in children’s books on the alphabet. But I plan on using these with my third kiddo, who loves puzzles at 2 years old. 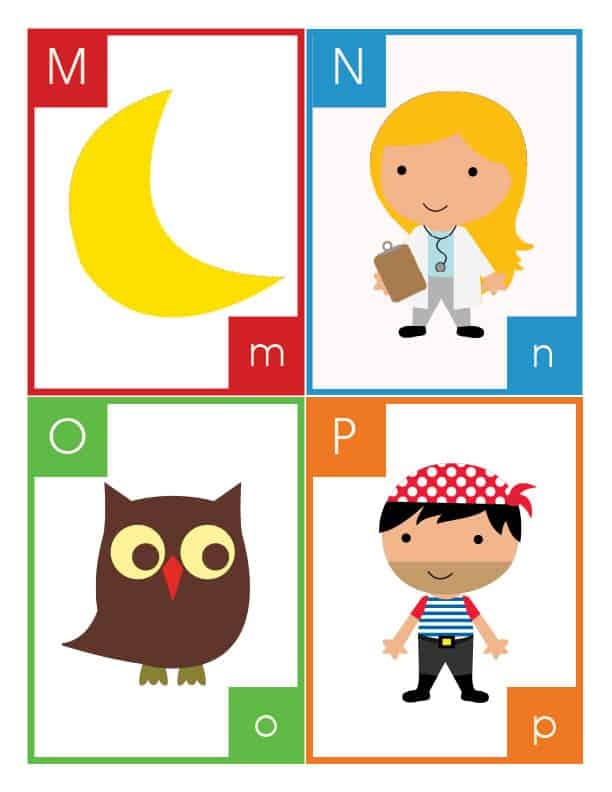 I think I will just switch out the “i” and “o” cards for some with short vowel sound pics. I was looking at your FABULOUS printables today and noticed the Aa-Zz puzzles pack has “Yacht” mispelled. I didn’t know if anyone had told you yet! Thanks Melanie! I actually did notice it, but sadly I’m not able to fix it. I bought the cards from a clipart company. I have emailed them trying to get a corrected card and hopefully I’ll get one soon! Thanks so much for the comment though! It was through you ladies that I first got the idea for the magnetic tape on the puzzles and size sorting and such. But we’re having an issue. I set my two (3 in the end of July!) year old daughter daughter down with them and in less than two seconds she is already taking the magnets off the back. (and leaving them in army-crawling sight of her fast sister). Obviously I’m not leaving either one of them alone with them, but I’m not sure what to do. I did love the idea of keeping them from jumping around and sliding, but I don’t know if she’s just curious why there is something on the back and just will not ignore it after I’ve explained it or what. Margaret, sorry I didn’t respond earlier. I was out of town when you left the comment and I totally forgot to come respond when I got home. I’ve been keep my thoughts open and nothing genius has come to me. My only thought so far was to hot glue the magnets on, so they are more secured. I’ll let know if I think of anything else! Thanks!